Catherine Zeta-Jones/Oceans 12 Interview by Paul Fischer in Palm Springs. 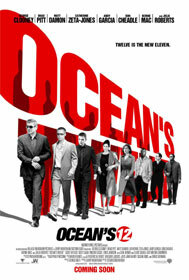 Oceans 12, the eagerly awaited follow-up to the brat pack remake of Oceans11, casts Zeta-Jones as a high ranking investigator both on the prowl for thieves like Danny Ocean, and ex-lover of Brad Pitt, who is trying to win her back. Now more the female centerpiece of this latest caper film, in comparing hers and Pitt's on screen pairing to that of Clooney and Roberts in the original, the actress says there are sharp differences. "We wanted to make them different from Danny and Tess. She's loving this guy so much and having to be dumped by him and then the relationship sort of comes together and she's so happy." She laughingly adds that working with Pitt was not such a terrible facet of making this move. "I bet I'm hated by women around the world for having to kiss this guy. My husband would say to me: `What are you doing today honey' and I'd say `Oh, I'm kissing Brad on a bridge' The next day `Oh I'm kissing Brad in the car or someplace'. It was a tough job, but somebody had to do it. We had a lot of fun. I'd love to do another movie with him in a different connotation", she says. "Maybe a musical." Zeta-Jones says she didn't need much incentive to join this illustrious gang of thieves, when initially approached by producer Jerry Weintraub. "I met Jerry before and I worked with George and Steve Soderbergh on Traffic and soon with Julia, and I knew that the Ocean's 12 was going to be starting up soon and I didn't think for one minute that it was going to be anyone than the characters that were formed already. So when I got the call from Jerry and Steven, I took a look at the script and I was in." Zeta-Jones describes her character as having "the blood of the best thief in the world and as much as she hates them, hasn't seen her father and is distressed over her lost love, there's a lot to play with. Also, it was nice that I was in Europe, being European and I was very proud to give a speech at The Hague. It was also very good to know that Europol agents wear red leather to work. When I was researching the character, I didn't think I'd be wearing red leather," she adds, laughingly. And when it comes to motherhood, Zeta-Jones says she was thrilled to share her experiences with the now pregnant Julia Roberts. "It's nice to see somebody having that experience for the first time, reminding me how ecstatic it was for me. I remember the advice my mother told me; 'You enjoy it now. You enjoy every moment as it gets better and better."